In the evolution of a business, there may come a time when it is necessary to restructure into a company. Often, non-tax factors will trigger this: government regulations, a need to attract equity investment, corporatisation leading to a potential buyout, or a need to fund working capital. The superannuation reform announced in the 2016 Federal Budget have largely been implemented. Many of the changes simply adopt the government announcement. However, there are some changes that are not so obvious which require strategic planning action, and provide opportunities to add value. Our take on these less obvious changes as set out below. There is a general misconception that where a member’s balance exceeds the transfer balance cap ($1.6 million), there is a requirement to reduce the balance prior to 1 July 2017. The legislation provides no such requirement. A reduction is only required if the Commissioner gives a determination (Section 136-10). If a failure to reduce causes an excess transfer balance on an after 1 July 2017, the consequence is excess transfer balance tax is payable at the rate of 15% (the same rate that is payable for assets that are not in pension mode). A higher rate of 30% is only payable after 1 July 2019 if the member has previously been liable for excess transfer balance tax for a year that commenced on or after 1 July 2018. Two elements that may make it beneficial to do a reduction prior to 1 July 2017 are to access the cost base upgrade and the transitional excess transfer balance of $1.7 million. Planning Point: failure to reduce by 1 July 2017 simply triggers 15% tax on the excess (the same rate is payable if the reduction had occurred). 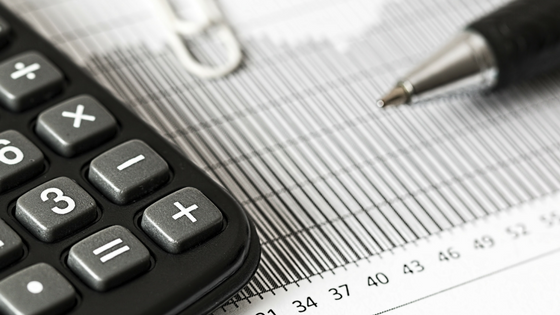 If the member’s circumstances warrant (for example, lumpy assets), may consider deferring reduction until prior to 1 July 2019 or receipt of an ATO determination. There is a maximum cap of $1.6 million per taxpayer that is eligible for the pension exemption. It is not possible to avoid the cap by splitting the superannuation balance over several superannuation funds. 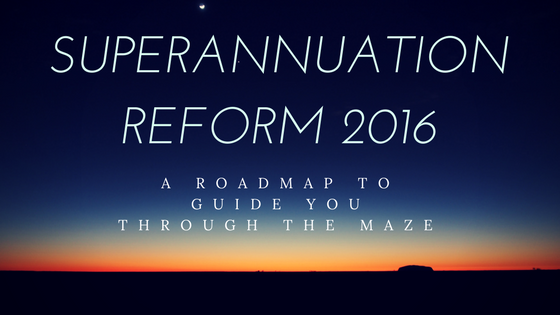 The 2016 Federal Budget proposed the most significant reform to superannuation since 2007. Much of the legislation for the implementation of that reform has been implemented with the passing of the Treasury Laws Amendment (Fair and Sustainable Superannuation) Act 2016. Many of the changes included in the legislation will be obvious: pension exemption limit of $1.6 million, changes in contribution caps, removal of anti-detriment deductions, changes in thresholds, etc. However, some of the changes included are not so obvious which provide traps for the unwary, but more importantly opportunities to add value. Where a member exceeds their transfer balance cap, the member or superannuation fund is not automatically required to reduce that balance, but the member is liable for excess transfer balance tax. Rather, the balance only needs to be reduced if the Commissioner gives a determination (Section 136-10). An excess transfer balance is subject to additional tax on excess transfer balance earnings at the rate of 15% if it is the first time an excess balance has arisen in the member’s account, and 30% for a later year commencing after 1 July 2019 when there is an excess balance (Section 294-230 (2) and Section 5 of the Superannuation (Excess Transfer Balance Tax) Imposition Act 2016). Excess transfer balance earnings are not actual earnings, but rather notional earnings based on the GIC rate (Section 294-235). 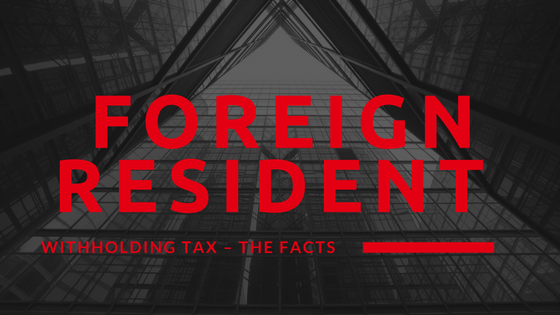 The general thrust of the new foreign resident withholding tax regime is to require a purchaser to withhold 10% of the purchase price on acquisitions from foreign vendors of real property (real estate), or shares in a company that holds real estate. However, the rules apply to all transactions involving real property and shares in companies, even if between two residents, unless steps are taken to fit within an exclusion. - The regime applies to all transactions involving taxable Australian real property (including a mining, quarrying or prospecting right) exceeding a market value of $2million just after the transaction, even if the vendor is a resident. - Company title is also treated as a direct interest. - The obligation is to withhold 10% of the 1st element of the cost base, usually the purchase price or the varied amount if the ATO provides a variation (even if the transaction would not be liable for CGT e.g. deceased estates, CGT rollover). Note: On 6 September 2016 an ATO Legislative Instrument was registered that varied the payment to nil for assets passing under a deceased estate. The instrument also applies to assets passing under a joint tenancy. - The $2 million threshold is based on market value, not the purchase price. If only a partial interest is being sold, the $2 million threshold applies to the value of the whole property. - All vendors must obtain a Clearance Certificate for a period covering the time the transaction is entered into. - Declaration by the vendor (see below) will not be sufficient. 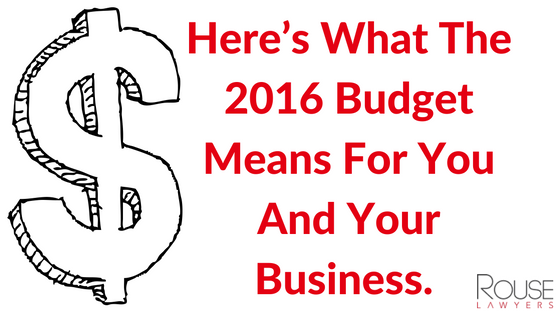 Here’s What The 2016 Budget Means For You And Your Business. The passing of each federal budget is of interest to those of us that practice in the tax structuring sphere. We will be keenly conscious of changes that may impact upon strategies that have been used previously and looking for opportunities for the implementation of new strategies. ** Threshold will be increased from $2m to $10m for small business income tax concessions, with the exception of the small business CGT concessions and the unincorporated small business tax discount.NOTE: $10 million threshold applies to the small business restructure rollover. ** Increased in phases over 10 years from 5% to 16%. The existing cap of $1,000 per individual for each income year will be retained.NOTE: This will effectively reduce the amount of income required for the full offset of $1000 from about $61,500 to $19,200. It now has a favourable comparison to the reduction in the tax rate for small business companies. ** Reduced to 25% over 10 years. Addresses transfer pricing issues relating to controlled transactions involving intangibles. Applies to company groups with global annual revenue of $1b or more. a capital gains tax exemption, provided investments are held for at least three years and less than 10 years. 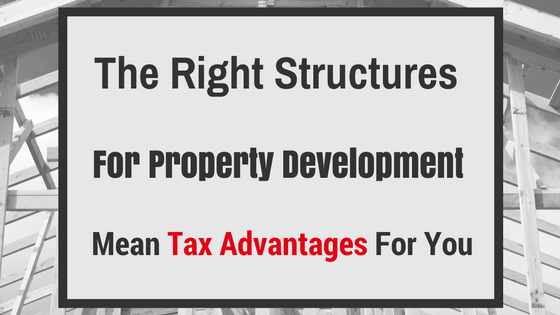 The choice of structures adopted for any property development project often has a key bearing on the tax implications and commercial viability of that particular project. Capital gains tax (CGT) is an important consideration for investment property or development projects in Australia, as is the relationship between property development and company tax rates. 1. Landowners - ensure the unrealised gain at commencement is taxed as a capital gain (which may be eligible for concessions including the exemption for pre-CGT assets and the CGT discount for post-CGT assets) rather than as ordinary income, without incurring tax restructure costs. 2. Property developers - offsetting the profit of one project against expenditure of the next project (providing a tax deferral). 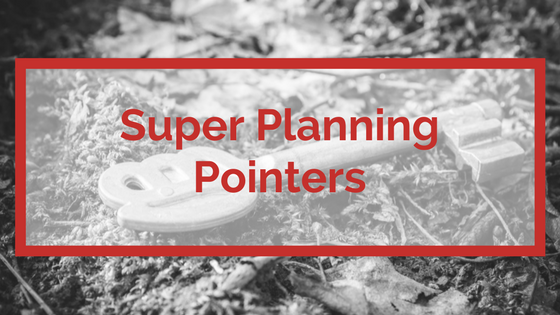 The circumstance we are dealing with is where a landowner has held a property on capital account (for example, a farming property or family home) which is now suitable for development. 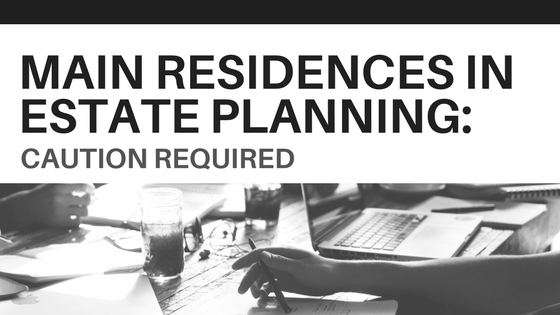 A simple sale of the property may be eligible for capital gains tax concessions in Australia, including the CGT discount and small business concessions. If the landowner undertakes a development activity, the activity will usually comprise the carrying on of a business or a profit-making undertaking in respect of which the profit will be taxed as ordinary income (not as capital gains). Court appeals will often cost in excess of $200,000, which most clients will not want to pursue and will wish to avoid (a cost benefit analysis will not pass). Where the dispute involves an application of the law (as opposed to the calculation of an amount) the ATO view can often be misguided. A focused and powerful legal submission based on legal principles can often cause the ATO to change their view. This should be adopted no later than the objection stage to avoid the Court Appeal cost. A valuable example is included in this article. The Australian income tax system is based on self-assessment. Under this system, the ATO generally accepts returns as lodged. It then selects certain returns for review on various bases. For example, taxpayers in a particular occupation, returns disclosing a particular deduction or type of income, or returns disclosing deductions well above average or income well below average. On occasions, these reviews can occur prior to assessment but usually occur after assessment. The Appeal phase of the tax review process is expensive - the cost of running an appeal generally exceeds $200,000, and costs of up to $1 million are not uncommon. In our experience, where the review concerns application of the law to the client circumstances, the view of the ATO can be misguided. In that instance, a focused submission based on legal principles can achieve the desired results. To minimise costs, these submissions should usually be put forward at the position paper/objection phase.